Cedar Grove Playground, located just east of Cedar Grove Cemetery, is sandwiched between the City University of New York School of Law and J.H.S. 218 in Flushing, Queens. The cemetery is named for a group of cedar trees that once marked the graves of several men and women who died around the time of the American Revolution (1775-1783). In colonial times, the land that is now Cedar Grove Cemetery was part of a farm known as Spring Hill, which was formerly a portion of the Francis Lewis (1713-1802) estate. In 1762 the farm was in the possession of Thomas Willet, who sold the 120 acre farm to the then Lieutenant Governor of the Province of New York, Cadwallader Colden (1688-1776). Colden was born in Ireland in 1688 but was raised in Duns, Scotland. He followed in his father’s footsteps and enrolled at the University of Edinburgh, intending to become a minister. Young Cadwallader soon became interested in the sciences, however, and drifted away from the ministry. He earned a Bachelor of Arts from Edinburgh in 1705, and traveled to London to study medicine. In 1710, Colden immigrated to the colony of Pennsylvania, settling in Philadelphia. Colden was selected as the first Surveyor General of New York in 1719. He was appointed as Lieutenant Governor in 1761. Colden also was acting Governor of New York in 1765 when the Stamp Act was passed. Colden promised to enforce the act, a decision that led to the Lieutenant Governor’s capture by several members of the Sons of Liberty, who forced him to take an oath of allegiance before he was released. During his tenure in office, Colden was the leading official at the unveiling of a statue of King George III in Bowling Green, located in Southern Manhattan, which was torn down and melted into bullets by American troops in 1776. In addition to his participation in government, Colden was an accomplished scientist who corresponded about his work with Benjamin Franklin (1706-1790) and the Swedish botanist Carolus Linnaeus (1707-1778). In fact, the Lieutenant Governor’s theory on the cause of gravitation is credited with being the first scientific text published in the United States. Colden left his most notable mark on Cedar Grove Cemetery in 1763, when he built what became known as Spring Hill House on the property, which served as Colden’s summer residence. The area is the resting place for Cadwallader Colden and Thomas Willet, who included a provision in his sale of the property that let him be buried on the land. In 1769, the Spring Creek House was the birthplace of Cadwallader David Colden, the grandson of Cadwallader Colden. C.D. Colden attended school in Jamaica before finishing his education in London and serving as a Colonel in the War of 1812. He succeeded DeWitt Clinton (1769-1828) as Mayor of New York in 1818, was elected to Congress in 1821, and the State Senate in 1824. After Cadwallader Colden’s death on September 20, 1776, the land fell into the hands of his son David Colden. An ardent Loyalist, David was deported to Nova Scotia during the Revolution because of his support of British rule. When Colden attempted to apply for citizenship in the new nation after the Revolutionary War ended in 1783, his farm was confiscated and sold. In 1894 the Cedar Grove Cemetery Corporation purchased the land from its then owners, the Durkee family, and used the Colden home as the cemetery’s offices until the building was destroyed by a fire and replaced by a more modern structure. This playground opened as J.H.S. 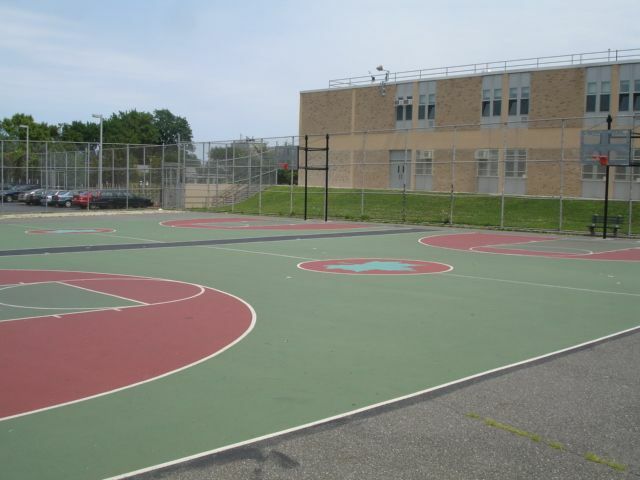 218 Playground on July 10, 1958, and has been jointly operated by Parks and the Board of Education since April 1954. Commissioner Stern gave the park its current name in 1987. Today, residents of Flushing and its surrounding communities use and enjoy the park’s large play area and rows of benches.